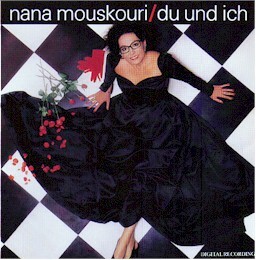 Nana Mouskouri (born: October 13, 1934) is a Greek female singer. In 1957, she recorded her first song, Fascination, in both Greek and English for Odeon/EMI Greece. She recorded about 1,500 songs in 15 languages on 450 albums. * only this song contains music of Vangelis (from the film "Missing"), with lyrics of C. Busse. Copyright owned by: Warner Bros Music and Phonogram International. in English: Why worry: Philips Cat. no: 1986. Song title: Missing. In French: Tu m'oublie: Philips Cat. no: 830563 1986. Song title: Tu m'oublies. In Italian: Con tutto il cuore. Philips Cat. no: 832935 1987. Song title: Ti ho perso. In German: Du und ich Cat. no: 832943 1987. Song title: Wo bist du. Lyrics taken from CD booklet.